If you’ve been to the Outer Banks, you know that this quote is absolutely true! The Outer Banks is a place where your stress melts away the minute you cross the bridge. A place where the fresh, salty air cleanses your soul. A place where you don’t need a schedule because you’re always on island time. This might seem obvious but don’t be so quick to move on to the next tip. Remember that the Outer Banks is a string of barrier islands and although we have grocery stores, hardware stores, and even major department stores, you don’t want to spend your hard-earned money or vacation time shopping for something you already have at home. While each Outer Banks Beach Rental home is equipped with useful objects, there are still some items you will need to bring yourself. Think about what you plan on cooking, what activities you plan on doing and who all is going on the trip to make sure you come equipped for each of those situations. For example, if Fido comes along but has to eat special food, you may not be able to find it as easily here so don’t forget to pack it! Making a list and checking it off as you pack will give you a peace of mind. Remember, the goal is to be able to go into immediate vacation mode as soon as you smell the ocean air. Here’s a great packing list to get you started. Picture this: A family packed into 3+ vehicles following one another in a row while attempting to navigate through Hampton Roads traffic, using walkie-talkies to communicate, and following handwritten notes on the printed MapQuest instructions. Sounds like a disaster waiting to happen, right? But chances are, most of you lived that exact experience if you’ve been coming to the Outer Banks for a long time. Traveling has certainly become easier through the years but that doesn’t mean you shouldn’t have a plan. 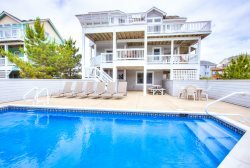 The Outer Banks might be a dream come true but if you travel at the wrong time, getting to your Nags Head Vacation Rental could be a nightmare. During the peak season, (weekends during the summer) there is a lot of traffic coming in and going out of the Outer Banks. Luckily, there are steps you can take to avoid the infamous 20-mile backup near Wright Memorial Bridge. There are two main entrances to the Outer Banks – Hwy 64 East if you are coming in from the West and U.S. Hwy 158 at Wright Memorial Bridge if you are coming in from the North. Although both routes have traffic, the northern route is usually where the big back-ups occur. Not only does traffic over the bridge back-up regularly on turn-over days (Saturday and Sunday), most people find themselves driving through busy areas like Norfolk/Chesapeake/Hampton Roads/VA Beach meaning there is opportunity for a back-up before you even get to North Carolina. Check VA DOT and NC DOT websites for up-to-date traffic cams and road closure information. First things first, avoid peak travel times - between 11:00 AM and 3:00 pm - when most travelers are heading to check-in. Trust us on this – it’s better to get into the area early and wait for your house to be ready than to sit stalled in a hot car after several hours of already being on the road. Another suggestion is to utilize your phone’s GPS. Even if you know the best route by heart, it will alert and re-route you if there are accidents, road work, or any unforeseen traffic jams along your way. As we mentioned, it’s better to get to the Outer Banks before your check-in so you don’t get stuck in traffic but just because you are in town doesn’t mean your rental will be ready. Most rental companies have designated check-in times to allow housekeeping staff to get the place ready for you. There’s no need to waste the whole day traveling… check-in day is still part of your vacation after all! So what should you do while you wait? Our favorite idea is to grab lunch! There are many great places serving up a taste of the Outer Banks even at lunch time. Here are a few restaurants in Kill Devil Hills your family might enjoy. You could also check out some local stores or get your grocery shopping done. Remember that everyone coming to the OBX needs groceries for their vacation so stores get packed pretty quickly around check-in time - go early or wait until late evening! Try visiting a local museum or historic site or stop by the aquarium. Last, but definitely not least, you can always hit the beach! There are several public beach accesses with outdoor showers so you can rinse off before you head to your clean Corolla Beach Rental! It happens all too often. You head down to the beach after breakfast ready for a relaxing day by the ocean, excited to feel the sand between your toes. But by mid-afternoon, you’re ready to head back and as you take the first step towards the dunes, your come to the horrific realization that you’re barefoot and the sand is SCALDING. A 90-degree summer day may be great for swimming but it also means the sand has absorbed sun all day long and at that temperature, the sand has the potential to reach up 120 degrees! This level of heat can cause 1st and 2nd degree thermal burns to your feet. By simply bringing foot wear to the beach with you, you can avoid that painful, mad dash back to your car. Remember that flip-flops tend to sink down into the hot sand and kick it back on your legs so we suggest investing in some water shoes. Sand also poses a threat to your cell phone. Sand tends to get everywhere and the gritty texture can scratch your screen, get clogged in the charging port, and even get stuck on the inside of your case. Even if you avoid using your phone after touching the sand or being in the water, fine grains of sand are always blowing in the ocean breeze. Plus, if you’re trying to get an awesome ocean picture, a large wave with a little sea spray is all it takes to ruin your phone. If you still want to take your phone down to the beach, it might be a good idea to use a waterproof phone pouch. These plastic pouches protect your phone from the beach elements while letting you still use the touch screen through the plastic. Since you can easily get one for a few bucks, it’s a great investment when you compare it to the cost of a brand-new cell phone! The beach is an amazing place to visit but it can also present new hazards if you are unfamiliar with the coast. Spending a day on the beach is generally a harmless activity but safety should always be your number one priority. Sun poisoning, dehydration, and rip currents are dangers you could encounter while on the Outer Banks so it’s a good idea to educate yourself on Proper Beach Safety. Fun in the sun can quickly turn into a negative experience if you are bit by a bug, get cut by a shell, stung by a jellyfish, encounter poison ivy, experience sea-sickness, get sunburned, or even get swimmers ear. You don’t typically have these same hazards when vacationing in the city so having a basic first-aid kit may not be enough. Come prepared with items like hydrocortisone, aloe gel, ear drops, Dramamine, bug spray, and sunscreen to help relieve a small inconvenience before it comes a big problem. Click here for a full list of First Aid Kit ideas.